In Indian Classical music, progress is not only permissible but essential, even though it has to be carefully monitored to insure that the spirit of the tradition is preserved. Vilayat Khan once said “Too much tradition makes for dead wood. But I don’t want so much progress as to lose my identity.” Khan is considered to be more of a traditionalist than his fellow sitarist Ravi Shankar, but he radically redesigned the sitar to enable it to play the sustained notes of Indian vocal music. New instruments are constantly being adapted to Indian classical music, including Prasanna’s Electric Guitar, L. Shankar’s double necked Violin, Kadri Gopalnath’s Saxophone, U. Srinivas’ mandolin, Abhijit Pohankar’s electric piano, and the slide guitars of Vishwa Mohan Bhatt and Debashish Bhattacharya. I’ve often thought of their struggle to balance tradition and progress as I’ve transplanted traditional Hindustani music to my touchstyle veena. 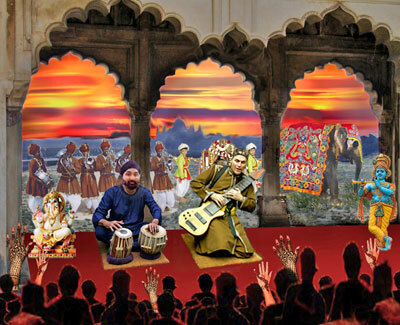 When I was playing fusion music, I often combined ragas with harmonies and chord progressions. I discovered, however, that this constrains the structure for improvisation, and thus makes the music less profound and complex than the single melody of traditional ragas. Consequently, I never play harmonies, as the concept is understood in the West—no sixths, thirds, major sevenths etc. So how can I take advantage of the two handed capabilities of my instrument? That’s a question I’ll be asking for the rest of my life, but here are a few answers I’ve come up with so far. Two notes played an octave apart have exactly the same overtones. If you set a synthesizer or an organ so that an octave plays on every note, eventually you hear it as only one note. Because my left hand and right hand strings have very different tone colors, I can create three very different kinds of octaves: 1) treble string (which sound like Jazz Guitarist Wes Montgomery) 2) Bass string (which sound rather like the bass octaves of a ragtime piano) 3) Two handed, which enable me to play different tone colors on the same note in each hand simultaneously (bending in one hand, sliding with the other/ muting in one hand, trills in the other etc.) I can also do this with unisons. 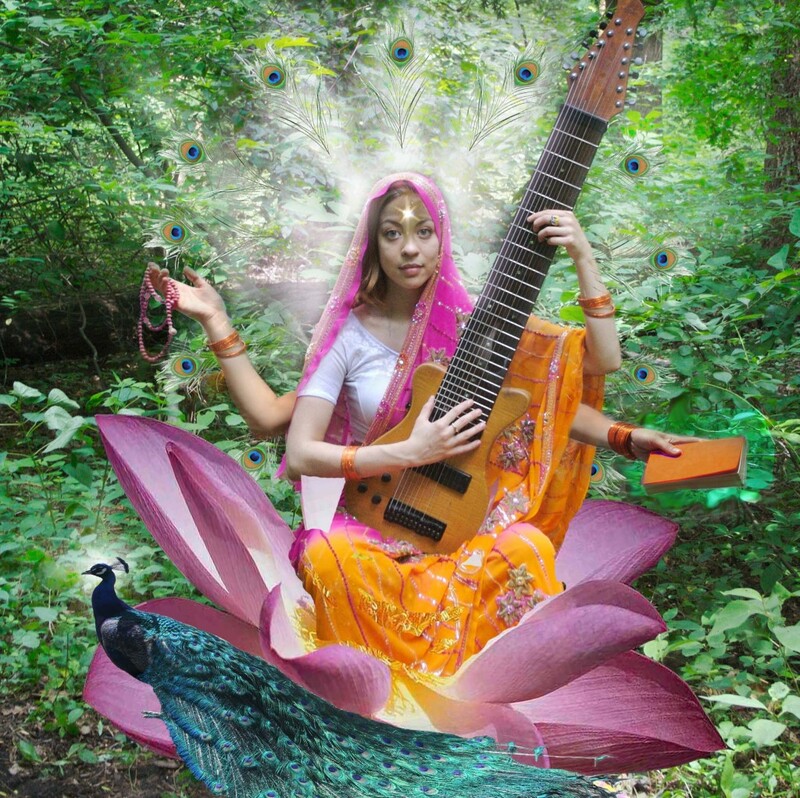 Sitars and sarods have strings which are tuned to play only the drone notes (usually tonic and fifth). These strings are played in complex rhythmic alternation with the melody strings, especially during the fast chikare section that ends a raga performance. On a touch style instrument, it is possible to create a rich almost orchestral sound by playing drone and melody simultaneously. It is also possible to play cross rhythmic variations by doubling the drone notes on several strings with both hands. In the late 1950s, Ravi Shankar and Ali Akbar Khan created a new form in which two melody instruments perform together. This doesn’t sound very surprising to westerners, but jugalbandi should not be seen as one step towards forming an orchestra. It is a completely different perspective: Two soloists in interactive conversation, not fused together in a single ensemble. On a touchstyle veena, it is possible for one musician to play jugalbandi with himself. Both hands talk to each other, improvising melodies and then repeating them with variations in the other hand. These are some of the techniques I am adding to the complex melodic and rhythmic rules that define ragas and talas. After years of trying to transplant this tradition to a fusion style, I have now decided it belongs exactly where I found it. It is impossible to feel fully satisfied when you stand in the shadow of a genius like Ustad Ali Akbar Khansahib. But I hope this music has an integrity that makes listening to it worthwhile.